During the last few years, many publishers in Europe experimented with changes to news formats. However, not all of these experiments in providing handy, magazine-like papers succeeded. 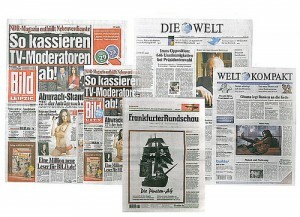 The Swiss yellow-press paper Blick returned from tabloid style to its former large format – likely to distinguish itself from overwhelming competition among the free press – and the Frankfurter Rundschau in Germany lost subscribers as a result of its change to tabloid format. Michael Haller, media researcher from the University of Lipsia, released detailed empirical research results in the German trade Message. His tenor implies the smaller format is doubtlessly handier. Yet the success of a format change relies heavily on implementation. For example, the German Welt kompakt and the British Guardian have had success with smaller formats as they continue to offer a “real” newspaper in favor of a magazine – meaning the front page offers an overview of the most important news. Subscribers expect this kind of service and dislike front pages in which only a single lead story is offered.